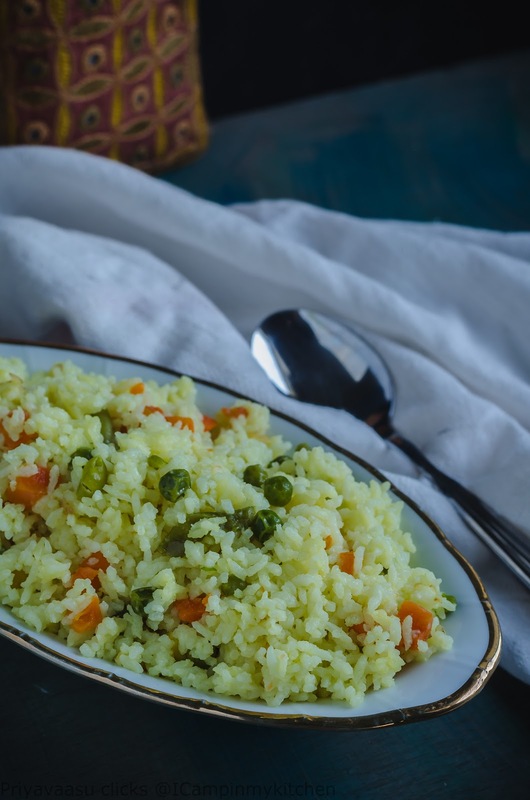 Wali wa Nazi (wali, cooked rice; nazi, coconut) is a Swahili dish popular on Africa's Indian ocean coast, particularly in Swahili areas like Zanzibar, Lamu, Malindi, and Mombasa. Traditionally, this dish is made using homemade coconut milk (maziwa ya nazi in Swahili) from shredded coconut and served with a non-veg curry. 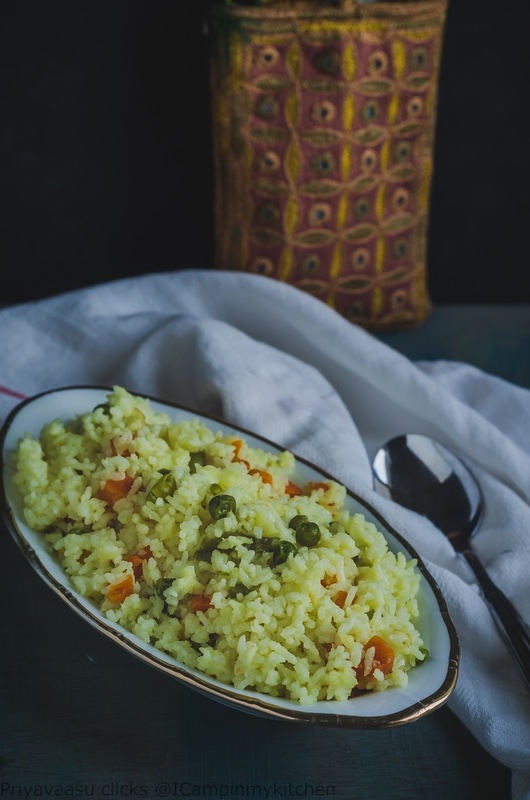 Here i have made same coconut rice with peas and carrots and used turmeric powder to give it a rich yellow hue. It can also be done using canned coconut milk, if using canned coconut milk, shake the can well, to mix the contents uniformly and then divide the milk and use equal amounts of milk and water to cook the rice. I served this rice to my hubby for a early dinner, he loved it super hot straight from the pan, the warm flavors were so apt and on the dot for this super chill weather. We didn't need any side for this while having it hot, if you prefer, serve it some spicy side. Wash and soak rice for 15 minutes. Heat a pan, add coconut oil, when it is hot, add the frozen veggies, green chilies if adding,and saute for 2-3 minutes. Now add the rice and sauce for a minute. To this now add coconut milk and warm water. Add turmeric powder and salt, mix well. Cover and cook for 10 - 15 minutes. Stir inbetween once and check whether it needs some more liquid to cook, if yes, then equal amounts of coconut milk and water and add to the rice. I didn't add any extra liquid, the 2 cups was good enough to cook the rice well. Once done, remove from heat, fluff up the rice with a fork and serve it warm with a spicy side or a simple cucumber salad. Wow..We do prepare the coconut milk rice flavored with ghee and whole garam masala spices and served with non-veg curry(especially mutton) and we usually prepare it on the day after any function in the family like marriage,engagement.I'm wondering what a similarity in the cuisine across continents. BTW the rice looks delicious and i love the bright yellow color. Very flavorful and easy to make dish. Looks yumm!! 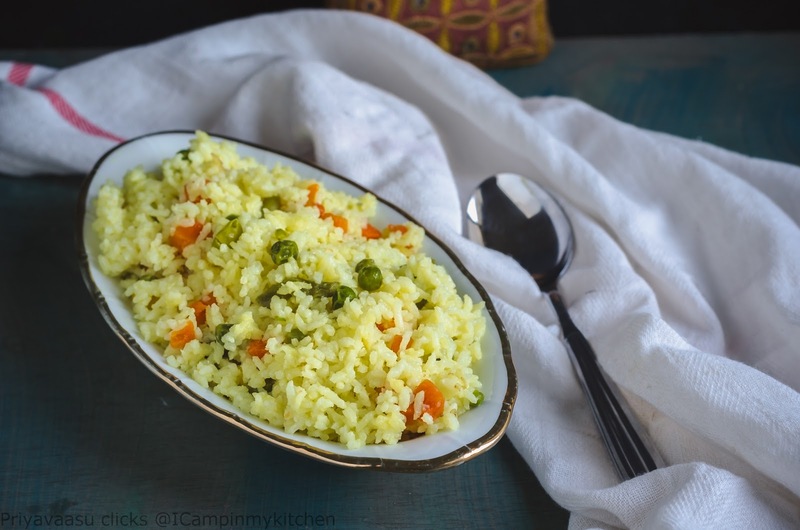 Very simple and easy rice dish, i want to make some soon. Must be a great flavourful rice. We have similar rice recipe loaded with cashews and raisin..
What an aromatic rice dish this is. I have never tried that particular rice that you have mentioned. Ok I give up trying to pronounce the dish name, however the preparation makes up for it..very nice!